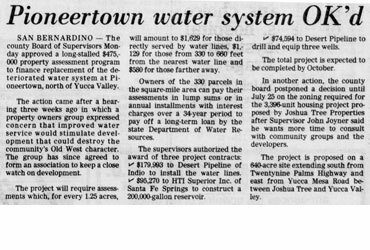 A public hearing on the complaints of Pioneertown and Rim Rock property owners about the ownership and operation of the water system has been set by the California Public Utilities Commission for next Tuesday. Proceedings will begin at 10:30 a m. in the Masonic Temple, 29 Palms Highway, Yucca Valley, with CPUC Examiner Kent C. Rogers presiding. Both property owner groups seek clarification as to who owns the water facilities and rights. 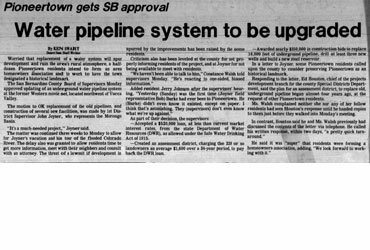 They also request that the CPUC declare the water system to be a public utility and order the owner to provide an adequate water supply in the service area. Named respondents in the complaint are Pioneertown Utilities Company. Pioneertown Corporation, Mt. 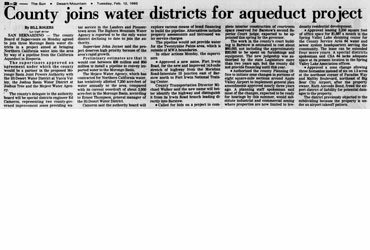 San Gorgonio Water Company, Golden Empire, Golden Empire Land Development Company, Golden Empire Water Company, and several individuals affiliated with these firms.